Many congregations will sing those words this coming Sunday, but they are already flowing through my heart and my brain as I go through this week. Of course, we will remember those who died this year. We will give thanks for their life. But we also can not avoid the truth that while they are at rest, the work is not done. They left things unfinished. I think that’s part of the treasure of our Lutheran understanding of baptism, of sainthood, of the priesthood of all believers. In baptism we all are made saints. Saints aren’t just the folks who decorate our stained glass windows. We all are saints right now. Being a saint doesn’t mean I’m perfectly pure. All it means is that I have work to do. Sure I have all that regular stuff like cooking, cleaning, etc., but that’s not the half of it. Saints make sure we don’t spiritualize Jesus’ words. Saints don’t patronize the poor with paltry gifts of charity. Saints make peace in homes, on our streets, in our schools. 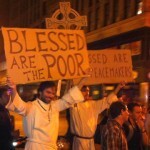 Jesus’ words create an upside down world where the poor, the oppressed, the left-out are lifted up. Saints are the ones who put Jesus words into practice. Looking at our culture, our world, our country there’s an awful lot of labor to be done. So, thank you saints in heaven’s light; now it’s our turn.